We do this through crusades in rural villages and urban areas in nations where the gospel has never been or rarely heard. Our commission and mission is found in Mark 16:15 where Jesus tells us to “go into all the world and preach the good news to all of creation.” We tend to conduct nightly crusades after we've completed all-day training conferences with local evangelists and pastors. They can be open-air crusades or conducted in auditoriums or churches. In more restricted Communist or Religiously-controlled countries crusades are done in churches or if we have obtained permits, in a rented building. In smaller villages we may preach the gospel from house to house or in the village square. Our crusades consist of preaching the word of God for the salvation of souls, praying for the sick for healing, testimonies, and worship music. This is all done to ignite faith and hope to a people who do not have any. Many times during the day of a 1-2 night crusade, Ignite the World Ministries will also conduct medical and dental clinics, children’s outreaches at orphanages, women’s conferences, preach in the prisons, visit and pray for the sick in hospitals, and distribute bags of rice and clothing to the poor. 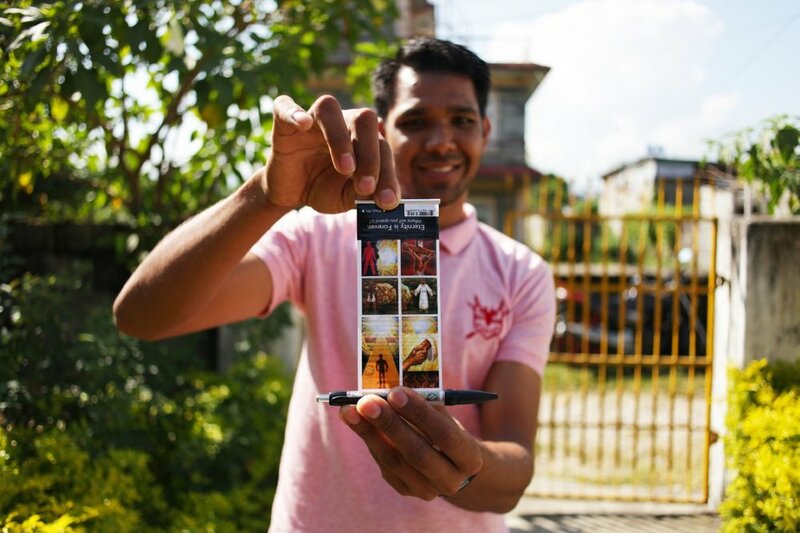 Other forms of evangelistic outreach include showing the Jesus Film, distributing SD Memory "Gospel Chips" for cell phones, and providing non-reading villagers living in remote areas with solar audio Bibles. See "evangel-tools" described below. It is then our strategy and plan to have local pastors and church laypeople teach and disciple these new believers so they too will be “igniters” of the faith. With these three different tracts, a listener can be introduced to the “One True God” and His Holy Word for the first time, receive Christ by saying the “Sinner’s Prayer” by way of the Jesus Film-Audio Track, and begin to grow in Christ and be discipled by listening to the New Testament in their native language. We have received many wonderful testimonies of people hearing the Word in this simple, but powerful way. For a very small cost, a whole village can come to hear the Gospel, receive salvation, and be discipled in the Scriptures. $35 can provide a Solar Audio Bible to a group of non-reading villagers with no electricity in the remote mountains of Mindanao, Philippines. With no electricity, batteries or generator fuel needed 200-300 people at a time can be “ignited” by video through the Solar Video Projection System or the "Movie Theatre in a Backpack". This portable 25 lb., solar multi-media system can be carried by backpack by our Igniters, village to village and present the Gospel via “The Jesus Film”. Most of the world’s non-readers are oral and visual learners. $850 can provide the “Jesus Film” to 200-300 people a night in Nepal through the Backpack Solar Video Projection System. Imagine millions of unreached people hearing the Gospel in their own dialects through their cell phones. ITWM has been able to produce an SD card containing “The Jesus Film” in audio that fits almost any third world cell phone. Additionally we download any audio sermon message, worship music or testament of the Bible directly onto the card. Now our igniters can distribute these gospel “chips” to just about anyone anywhere, in the city or rural areas. Its a safe and easy way to get the Gospel out in heavily persecuted countries. $3 can provide a SD “Gospel” Card to a cell phone in Communist Vietnam and Laos. This is called our "Eternity is Forever" pen. It is great for one-on-one presentations of the Gospel. Here an Igniter can meet a non-believer for coffee or tea at a neighborhood café and show the salvation message by pulling out a scroll with Gospel pictures on it, which are contained within the pen. Then the Igniter can point to the different parts of the salvation message and tell the person about Christ. The Igniter can use the pen to write down contact information of this new believer and follow up with him or her and get them plugged into a bible-teaching church. A simple, but powerful evangel-tool! $3 can provide an Igniter with a simple, yet powerful tool to share the Gospel one on one. Bring comfort and hope to children in SE Asia who suffer from the loss of parents, homelessness, trafficking, disease, and poverty. For $30 dollars you can provide a child with a cuddly stuffed animal that internally equipped with a Solar Audio Bible. When placed in the sun during the day, it will provide a child with up 3 hours of Bible story listening time in the evenings. $30 can provide an orphan child in India with a “comforting” stuffed animal with a children’s solar audio Bible attached to it.